Waking up for the second morning in your tent the lack of clouds is the silver lining, so much so that many dare to start their day by heading into the arena without their wellies. The dawning of the first of the three days of live music sends a real “the weekend starts here!” wave across the farm as every stage, tent and odd thing on wheels open wide their doors to a curious public. The first stop we have to make is over at The West Holts Stage which arguably has one of the strongest and most exciting line-ups of all of the weekend’s venues. Nature has brought the sun and we’re matching it with the perfect summer soundtrack courtesy of South Carolina’s Toro Y Moi, whose funk infused synth-pop has the early afternoon crowd firmly in the groove. Real name Chaz Bundick heads up a band of four who play their signature, chilled out tracks from latest album Anything In Return (2013) as well as older crowd favourites like Still Sound, whose infectious bass line got us hooked back in 2011. After a quick chat and an illustration from Bundick we head out – and find ourselves one in a steady flow of revellers all headed over to The Other Stage to catch the second performance in as many days by indie rock force of four Alt-J. The great and ever increasing success the band has enjoyed since the release of their debut album, An Awesome Wave (2012) is evident as a packed crowd assembles, ready to hear it live in its entirety. Their fans are loyal, easily and vastly outnumbering the crowd from the night before at William’s Green. Whilst the guitars and electronics may not have had us dancing or singing along quite so much, the music was undoubtedly tight and the Mercury winners clearly enjoyed taking on Glastonbury’s other major stage and were very well received. As Alt-J finish a portion of crowd edge out and shuffle off back toward the Pyramid Stage or in the direction of the John Peel Stage. We however, take advantage of the freshly freed up space and are joined by newcomers, ready to watch our second indie rock instalment, Foals. 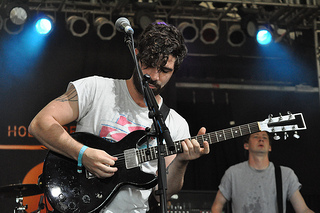 Vocalist and guitarist Yannis Philippakis filled the criteria of a rock front man, making not one but two crowd-surfing leaps during the set. Striding proud the length of the stage, he exhaled a raw, electric energy though epic, cordless guitar solos. 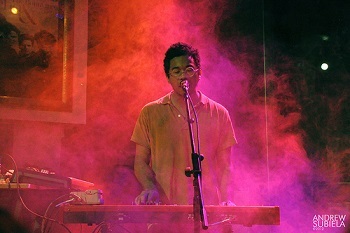 The set itself displayed the variety in the band’s material as dancier tracks like My Number moved into chart toppers like the haunting Spanish Sahara. Evening sets in and for the first time (and certainly not the last) we’ve hit a problem, the clashes. Impossibly the line-up for Glastonbury gets stronger and more vast every year, to the point where it’s almost easier to list who isn’t playing rather than who is. Inevitably this means at any one time you need to be at about twelve venues at once – quite hard even for the most well practiced festival goer. This problem is often most prominent come ten-ish when it’s time to decide, Pyramid Stage or something else? We made the call and sacrificed the Arctic Monkey’s to return again to West Holts to freak out to funk/soul master and disco legend Nile Rodgers and the hit machine that goes by the name Chic. We dance the night in with the never ending stream of classics the members of the band have been responsible for during a forty three year career. Rodgers’ signature rhythm on the guitar has us grooving like puppets as fantastical Friday draws to a close.